Horizon’s FD85 can go fast or slow, near or far, in shallow or transatlantic waters. 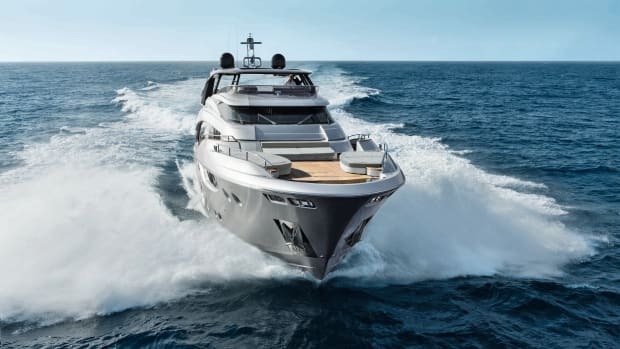 The term fast displacement is a non sequitur in the yachting world because fast and displacement don’t work together. 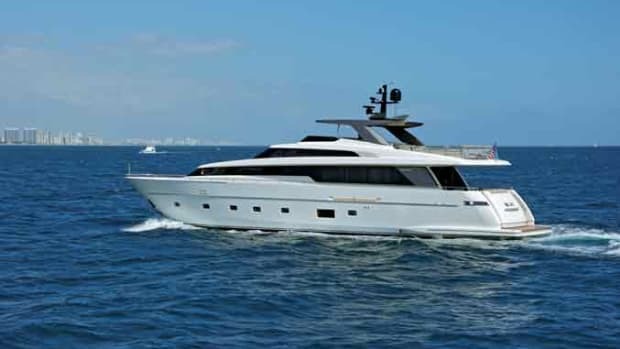 In the case of the Horizon FD85 (FD means fast displacement), designers have created a yacht that can cruise long distances at displacement speeds, yet pick up her skirts to scamper along when needed. One key design element is the FD85’s high-performance piercing bow. Every oceangoing ship these days has a bulbous bow protruding underwater to lull the sea into thinking the ship has a longer waterline, allowing higher speeds and efficiency. 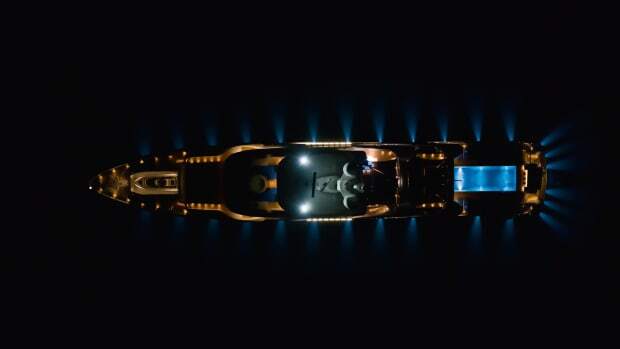 Same with the Horizon FD85, except Dutch designer Cor D. Rover, who is usually designing superyachts up to 220 feet (67 meters), flattened the bulb’s top to reduce pitching. Stir in a soft chine aft, prop tunnels to reduce draft, and a long skeg for directional stability, and the result is a yacht just as comfortable at 6 knots (easily transatlantic range) as she is getting to the best anchorage faster than 20 knots. Rover’s take on the flybridge is also original. 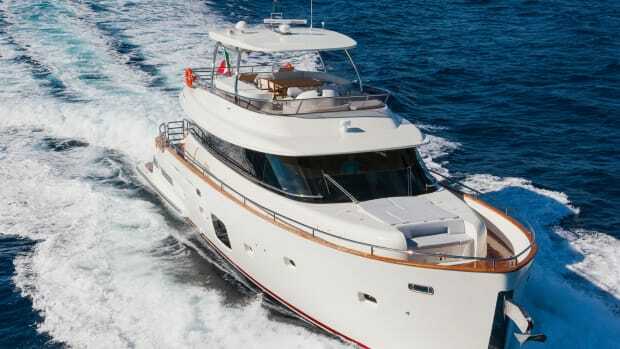 In profile view, the flybridge morphs smoothly into the foredeck, with the pilothouse peeping up at amidships. Under the standard fiberglass hardtop is lounge seating plus a grill, sink and fridge. 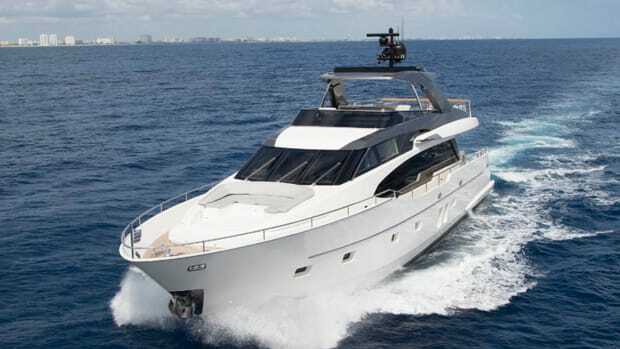 Aft is space for a spa tub, sunpad, lounges or water toys. 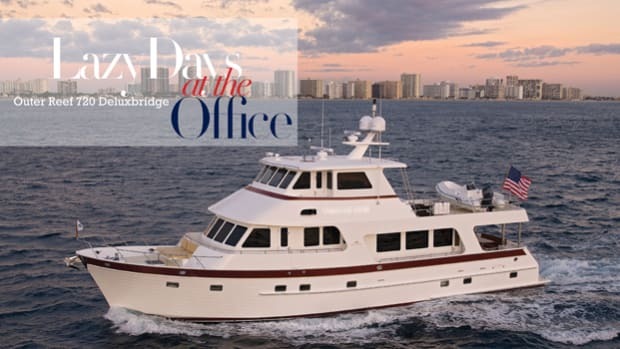 Guests can walk from the flybridge to the bow seating, and crew can pop out from the side door of the pilothouse to reach the anchor well forward, without changing levels. 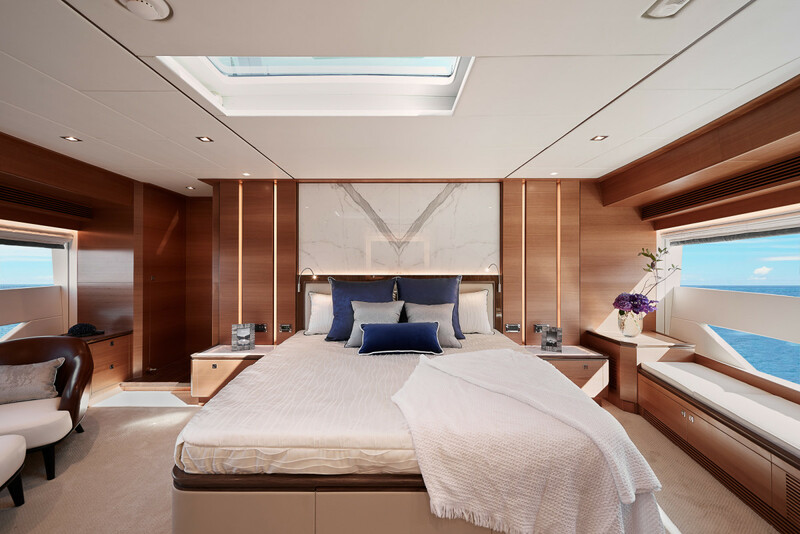 Inside, the main-deck master suite has a centerline king-size berth, room for a loose chair with a table and, thanks to space from the plumb bow design, a forward head and walk-in closet. 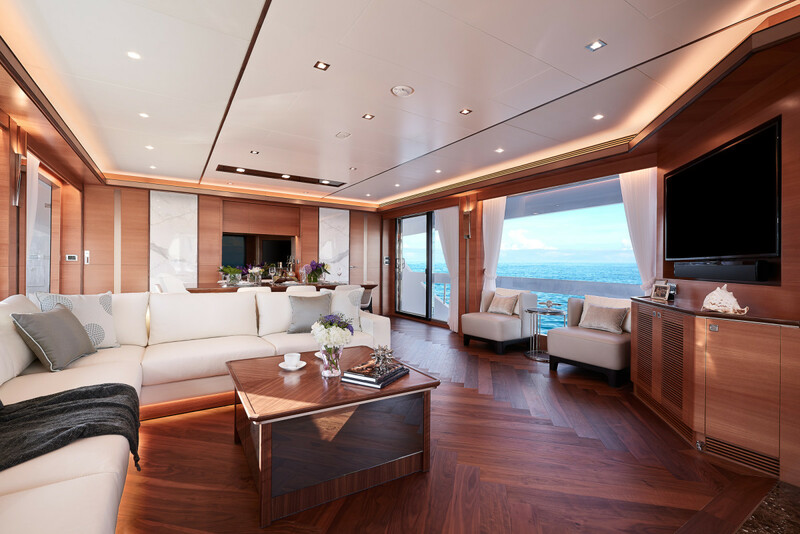 The remainder of the main deck includes the salon and a dining table that seats 10 without elbowing. Windows flow from sole to ceiling, with exterior bulkheads cut away to provide sweeping panoramas. And those windows are low-emissivity glass (low-e) that filters infrared and ultraviolet rays. 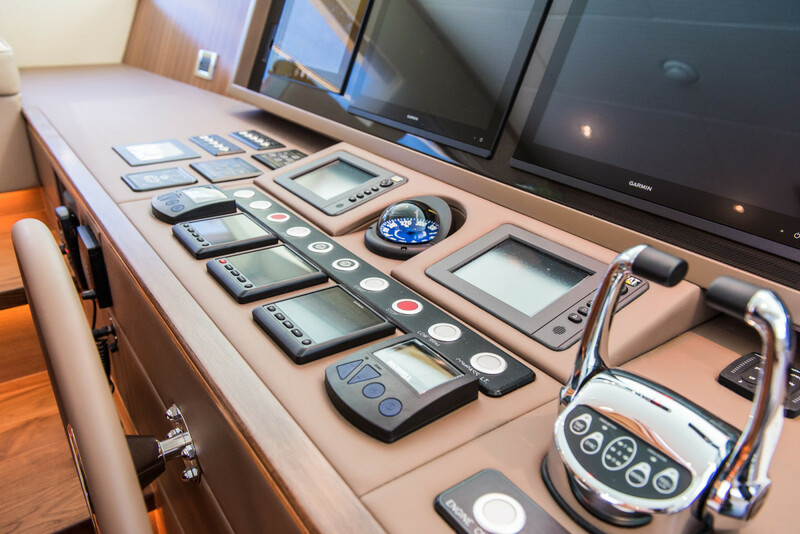 The pilothouse is simple and well-organized. 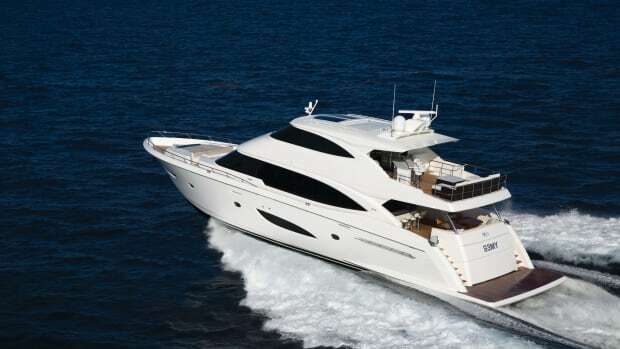 The galley is to port with a side door to the deck, and a day head is between the salon and afterdeck. 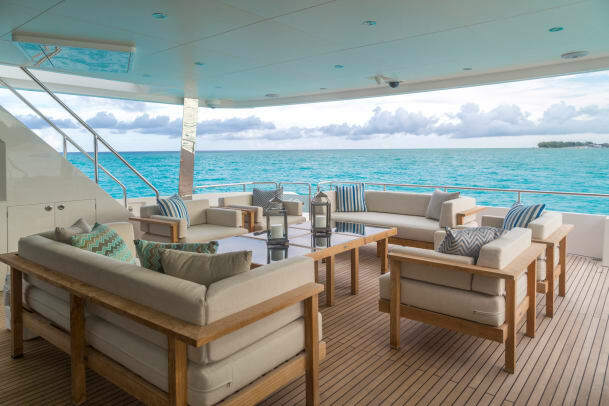 That afterdeck has a built-in settee, couches and chairs, all shaded by the bridge overhang. 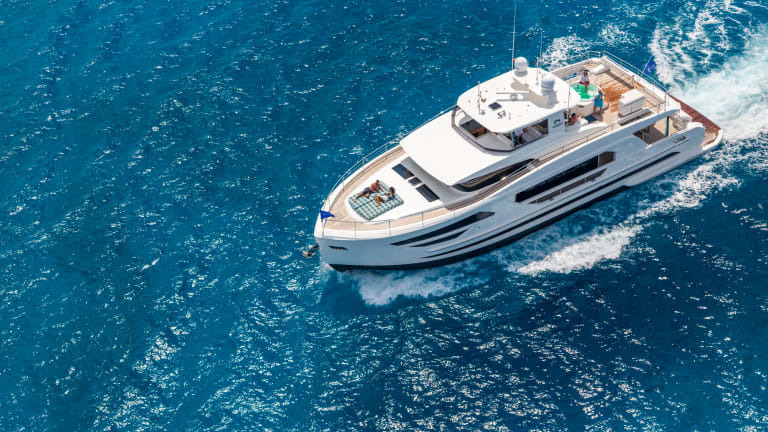 When it comes time to tuck in for the night, the FD85 has four guest staterooms on the lower deck—and three of them are VIPs. The fourth stateroom is fitted with a pair of berths and, like the VIPs, has an ensuite head with shower. That’s a total of five staterooms and six heads, not including the crew’s quarters, in an 85-foot (26-meter) yacht. Crew have two cabins abaft the engine room and private access to the power plants from the afterdeck (safe underway) or from the swim platform (not so much). Finished to the same standard as the guest areas, the crew space also has a head and a mess. 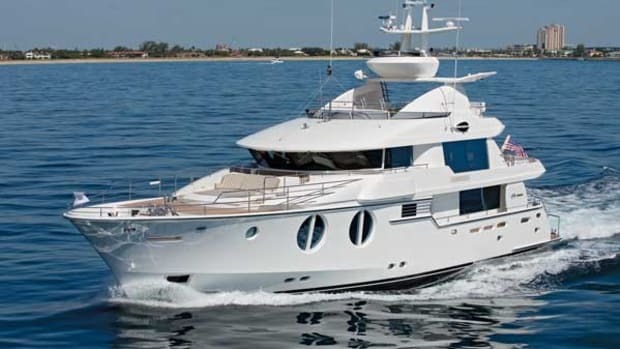 The skipper can drive from the helm station up top, forward to port with companion seating; or from the pilothouse, which can be closed for night running. 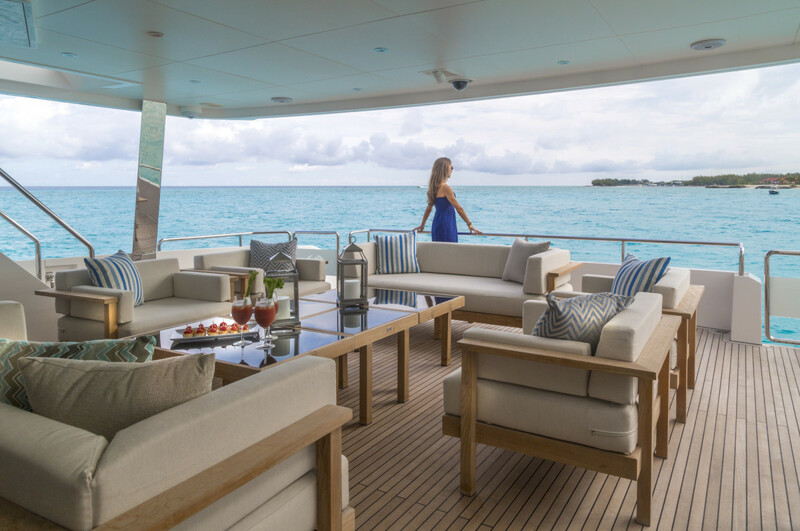 A pedestal seat is behind a four-monitor dashboard, and a dinette for guests or crew is nearby. Power for the FD85 in North America is a pair of 1,136-horsepower Caterpillar C18 Acert diesels, along with twin 27-kilowatt Onan gensets. 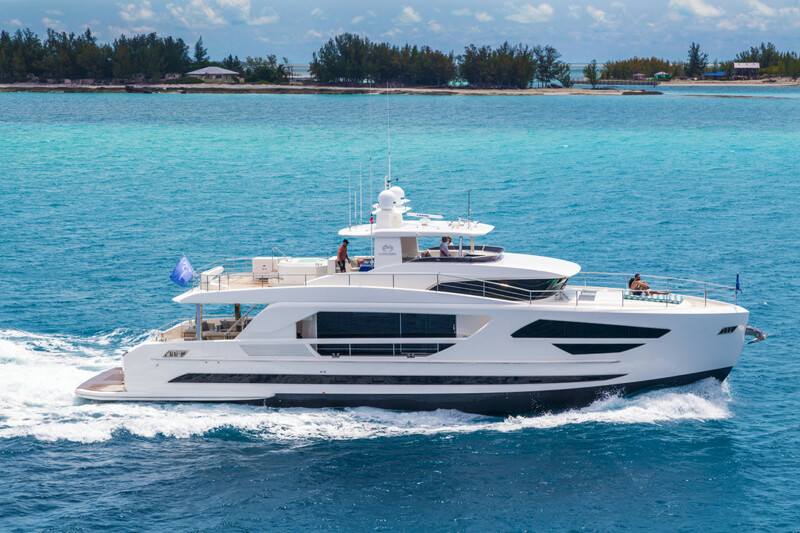 Horizon calls the FD85 “the 85-footer with a 100-foot attitude,” and for once, I find such an advertising slogan to be an understatement. 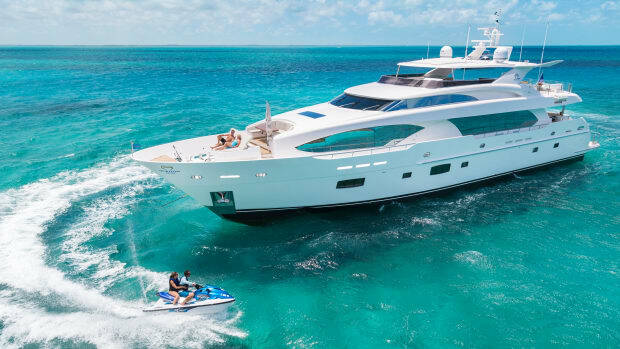 This yacht thinks it’s a 125-footer, except when it comes to finding a slip or navigating shallow cruising grounds.